I could easily put this story in the Ethics Alarms Zugzwang file, because I see no analysis or result that won’t make the situation worse. A white off-duty police officer named Amber R. Guyger entered the apartment of Botham Shem Jean, a 26 year old accountant, and fired her service weapon twice at him, killing the St. Lucia immigrant. She claims that she mistakenly entered the wrong apartment after returning home from her 14-hour shift and believed Jean, who is black, was an intruder. I’ll buy that. I wouldn’t say that the next step is an application to Hogwarts, however. So these are the people who presume to tell Americans what to think, eh? Good to know. But I digress. In a recent Washingtonian Magazine profile contrived to puff the release of “Finding Magic,” Bradlee’s widow says that she not only believes in hexes, she’s used them. And they work! She reveals that, in her less mellow days, she put hexes on three people who promptly wound up having their lives ruined, or ended. Ethically rather than legally, is there any difference between Sally Quinn and a murderer? I’d say that the first two victims make her the ethical equivalent of someone who is guilty of manslaughter, and the last one, after her first two hexes led to her targets’ deaths, was, again ethically rather than legally, premeditated murder. Later, she texted to Roy that his family accept his death, and that he would enjoy the afterlife. “Everyone will be sad for a while but they will get over it and move on. They won’t be in depression. I won’t let that happen. They know how sad you are, and they know that you are doing this to be happy and I think they will understand and accept it. They will always carry you in their hearts,” she texted. On July 12, 2014, Conrad drove to a Kmart parking lot and connected his truck to a pump that released carbon monoxide. When he lost his nerve and got out of the truck, his girl friend texted him to “get back in.” She never alerted any authorities to stop the suicide attempt. The young man was found dead in his truck. Ethics Quiz Of The Day: Deadly Dairy Queen? Harley Branham, 21, a manager at the Dairy Queen in Fayette, Missouri, has been charged with second degree felony manslaughter following the suicide of 17-year-old Kenneth Suttner, whom she supervised. At an inquest called by the Howard County coroner, witnesses testified that Branham mistreated the teen. She made Suttner lie on the restaurant floor as he cleaned it by hand, and once threw a cheeseburger at him. Other witnesses said the boy also had been bullied for years at his school, where students mocked his weight and a speech impediment. The coroner’s jury blamed both the Dairy Queen and the Glasgow School District for failures in training and prevention of harassment, concluding that Branham “was the principal in the cause of death,” and also that Dairy Queen negligently failed to properly train employees about harassment prevention and resolution, according to the inquest’s verdict form. Jurors also found that the Glasgow Public School system was negligent in failing to prevent his bullying. Suttner shot himself on December 21, 2015. Is this an ethical use of the criminal laws? —Nautika Harris (above, right), the cousin of a 17-year-old teen shot dead by a 54-year-old Miami woman as he tried to exit her home, which he had entered to burglarize. Miami-Dade police say that Trevon Johnson, 17, burglarized the home of a 54-year-old old woman last week. She was not in the house when the break-in occurred, but after being alerted by her surveillance system, she rushed home and found Johnson climbing out of a window. She shot him dead, and his relatives are outraged. When they take the field in Spring Training and for the rest of the 2015 baseball season, the St. Louis Cardinals will be wearing a memorial patch reading “OT” in honor of outfielder Oscar Taveras, the 22-year-old budding star outfielder who died in a car crash in his native Dominican Republic last October. Such mourning patches have become common since 1972, when the Pittsburgh Pirates moved beyond the traditional black armband to a personalized patch following the tragic death of the team’s Hall of Fame outfielder Roberto Clemente in a plane crash, as he was flying humanitarian aid to Nicaragua. Taveras, however, unlike Clemente, died in an act of reckless stupidity that took not only his own life but that of his 18-year-old girlfriend, Edilia Arvelo, as well. Toxicology tests showed that his blood alcohol level was five times the legal limit before the crash. situation is more complex because toxicology tests showed that his blood alcohol level at the time of his death was five times the legal limit. 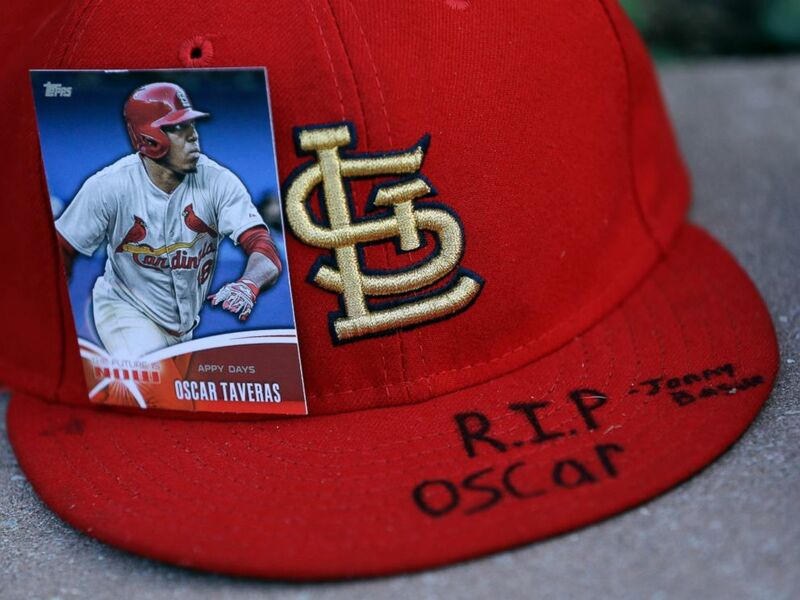 Moreover, Taveras’, also was killed in the crash. If Taveras had lived and Arvelo alone had died, he would have been prosecuted for manslaughter. Is it ethical for the Cardinals to publicly honor Taveras with a uniform patch?